The email verifier is a software program which is designed to help bulk mail campaigners get better control over their campaigns by removing redundant and flawed email addresses. In the majority of cases, individuals employing bulk email sending as a part of their online marketing campaigns end up cleaning their email lists on the basis of the bounce back they receive from redundant email addresses. This is an extremely cumbersome process which can require the individual to spend hours at a go. Another problem with having redundant and invalid email addresses in one’s mass mailing list can result in ISP’s blocking the sender from sending too many emails. With the help of our mail verifier program, such problems would be rendered null and void for your email marketing campaign. As emailing lists grow, they have a tendency to absorb many invalid and redundant email addresses. The reason for this is simply that the size of such emailing lists prevents their owners from sifting the invalid addresses from the valid addresses. This is precisely why our email verifier software was developed. The prime objective of our verification software program is to help you filter the invalid email addresses from your emailing lists automatically. Our goal as developers of this verifier program was to remove bouncing emails, reduce your bandwidth usage, and completely negate the possibility of your email address getting blocked by ISPs for sending too many superfluous emails. The principle on which this email verifier operates is automation. Handling huge emailing lists can be troublesome, not only in terms of removing redundant email addresses but also managing the list in a variety of other ways. There are three layers through which this software program works. The first of these is syntax check where this program would check the syntax of all the emails in your list. 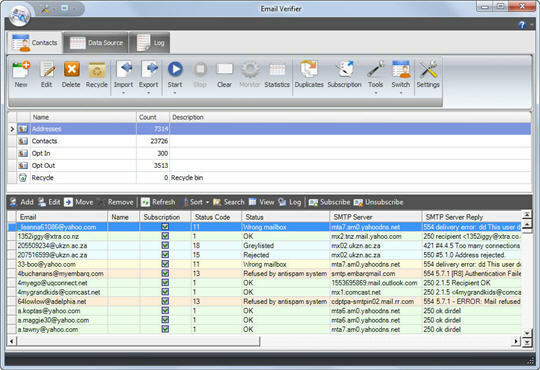 Following this, the software program graduates to checking the availability of specific email addresses and, in the final step, this program actually tries to create an SMTP connection with mail servers so as to test the relevance of the email address in question. There are three reasons why this mailing address verification is so far ahead of its competitors on the internet. The first of these reasons is the fact that the process uses three different layers to authenticate email addresses in your emailing list. The second is that your emailing list remains completely private as the software program does not require you to send your emailing lists to any third party. The third reason why this software program is celebrated by industry experts is that it would give you access to expanded email address statuses. The number of features that you will get through our mail verification software would far outstrip the capabilities of any other similar software program in the industry. Consider the following primary features with subsequent elaboration. In terms of speed, two things need to be specified. First is the inherent speed with which this software program can clear your emailing list of redundant email addresses. This software program has the ability to validate up to 50, 000 addresses every hour. The second thing is the way this software program can improve the speed of your email marketing campaign by reducing the bandwidth you use in sending redundant email addresses. While there are many verifiers in the market that you can use, there would be very few that would use a three layered technique to authenticate email addresses in your list. This software program has this capability through syntax check, domain check, and SMTP connection verification. The result is that, once your email list has gone through this software program, it is virtually flawless. We have developed this software program to be compatible to a wide variety of other software programs so as to facilitate synergy and integration. Firstly, this verifier would be compatible with our bulk mailer and autoresponder software programs. In addition to this, we have devised this software to be able to communicate with other programs such as Excel, Outlook, CSV, and external databases such as MySQL, Oracle, Access, Foxpro, and Paradox. We understand how important an emailing list can be for an online entrepreneur. This is why we have worked hard to facilitate privacy and security related benefits in our software. As a result, this software program would allow you to keep your emailing list with you at all times and even create backups and restore backups on a moment’s notice. Our email verifier software program has the potential to not only improve your conversion rate but also increase your profits.